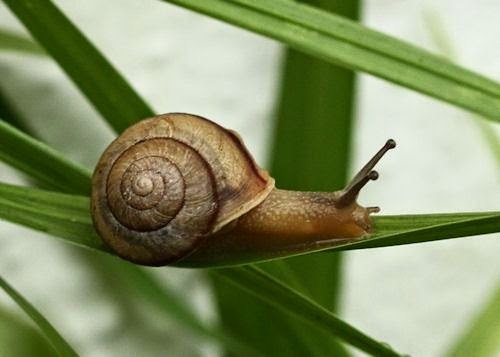 Cerita Inggris Indonesia: Why Snails Climb up Grass - Long long ago, Mr. Fish, Mr. Fly, Mr. Wasp and Mr. snail lived together in a small house. They divided the work among themselves. Mr. fish was the biggest and strongest. He was made the head of the house and his job was to find food. Mr. Fly, who could fly very fast, was made a messenger. Mr. Wasp was made a guard because of his painful sting. And Mr. Snail, who could only move slowly, looked after the house. Of course, his friends did not know what had happened to him. They waited for him for several days. By this time, they all felt very hungry. Then Mr. Fly was sent out to look for Mr. Fish. Suddenly, he saw something moving in the water below. It was a fish whose lips moved in and out on the surface of the water. He flew out of the house to look for Mr. Fish and Mr. Fly. While he was flying, his hunger became worse. He tightened his belt again and again until finally he broke into two. That was the end of Mr. Wasp. Now only Mr. Snail was left. He left the house to look for his three friends. He was crying because he felt so lonely. Whenever he found some grass, he would climb up it to look around for his friends. Even today snails still cry, and whenever they see any grass they will climb up it and look around for their old friends.